Wait until you see these adorable treats from Jacque right before Valentines Day. 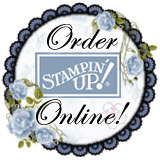 Did you see this stamp set in the Occasions Catalog? I thought it was cute... all the stamps are really cute! I think Jacque made this treat with her granddaughter for her school/class. Here's the back of the treat. Look at this card! I love that origami corset! Hummm, maybe an upcoming class project? ... something oragamied?